There are a number of factors involved in calculating the carbon footprint of your roast dinner, some of which are gaining more awareness than others. Until relatively recently, most people would do their weekly shop at the supermarket, putting in their trolley a combination of what they wanted, what they needed and what they could afford. The idea of looking at the provenance or country of origin on the label was unheard of. Now it is a different story and rightly so, because the choices we make today in the supermarket will have a huge knock on effect to the choices our children can make tomorrow.By using the Sunday roast as an example, it is incredible how different the environmental impact of our food choices can be. In most large supermarkets, pretty much everything is available pretty much all of the time. That in itself may seem rather ludicrous in a few years time, but at the moment it is still the case. You may go to buy the ingredients for your roast without a set menu in mind, so you may pick up a chicken from Hungary and green beans from Peru. Add in a jar of cranberry sauce from America and potatoes from Australia and your dinner will have clocked up over 23,000 miles, which is over 6.9kg of CO2. These food miles are not only from how far the food has actually travelled, but also from the methane gases in rearing the bird, the storage costs of the vegetables and the transportation methods. The various transportation methods are an underrated cause of environmental impact. For example, if a Kiwi fruit from New Zealand is brought to the UK by air freight, its food miles are considerably greater than if it travelled the same distance by sea. These details are yet to reach the labels in our supermarkets, but if you buy your fruit and vegetables from a greengrocer or farm shop, they will be able to tell you. The distribution and refrigeration also adds to the environmental impact. A good reason why the food miles are far lower when buying your roast dinner from your local farm shop is that you can only buy what they have in stock. In the supermarket, if the Chilean broccoli was side by side with the British cauliflower, you may just buy whichever one you fancy, whereas in the farm shop, only the cauliflower would be available, so you have no choice but to be a more responsible shopper. Now, some people may resent not having the choice, but do we really need to have strawberries and asparagus all year round? If we enjoy eating seasonally and locally, we get to have the wonderful early season potatoes and the first picked raspberries. 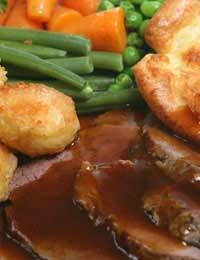 By buying your roast dinner from the farm shop, you will use only around 3.2 kg of CO2. You will also have a far tastier meal as the local meat, potatoes and vegetables will be fresher and better cared for. The carbon footprint of your roast dinner is also affected by the packaging processes used, which is invariably far greater in supermarket packaging.